The Cycling Dude: Cycling Dude Promoted at Florida Conference! Cycling Dude Promoted at Florida Conference! As regular readers know, over the last couple of years I've struck up a friendship with Randy Eady, of Glider Rider. His thoughts on spreading the word about cycling, and the cycling resources in my sidebar, and 5 years of blog posts, inspired me to create a special page in honor of my 5th Anniversary, in January, that I call Cycling Dude 101. Well, last month, Randy surprised me by doing something very special out of respect for my efforts, and as a thank you for spreading the word about Glider Rider to my small audience. Last month, St. Petersburg, Fl. was the scene of the International Conference on Aging, Disability, and Independence (ICADI), and Randy made a presentation as part of the Transportation Track of events on the agenda. The ICADI focussed on approaches to support people as they age in maintaining independence in daily living at home, at work and in the community. As people age, independence can be maintained by use of assistive technology, by modifying homes, workplaces and environments and by selecting products that follow universal design principles. As people remain in the workforce into advanced years or return to work, knowledge and technologies are developing to adapt workplaces to meet their needs....Mobility is another important component of independence as it relates to walking and wheeling, to driving and to using other methods of transportation. Issues and approaches to enhance the safe mobility of seniors. This includes identifying approaches to: 1) enhance driving (testing and driver remediation) to enable people to safely drive as late in life as possible; and 2) provide acceptable alternatives to driving. The session includes a focus on the role of low and high technology in enabling mobility later in life. His presentation was called "A New Approach To Adaptive Mobility Gait", and the 6 page Brochure on the left is titled "The Lowdown on Glider Riding and The SwitchBike", and was written by Karen Boehm, of Ultra-Sleek Mobility, LTD. 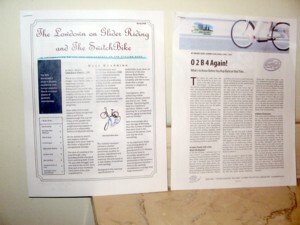 The other is a copy of the June 2007 piece I've written about before, called " O2B4 Again! : What's to know before you hop back on that trike." His demonstration was designed to make the case that the Adult Glider Rider makes for an ideal adaptive motion trainer for people with moderate orthopedic or balance challenges, and good for very short trips to places in your immediate community, and, that the SwitchBike is an alternative choice for people who commute or take distance rides for recreation, and are looking to avoid getting back pain when cycling. The adult version of the Glider Rider is due out in the Fall, and Ron De Jong's SwitchBike, a variation on the Recumbent that is 2 bikes in 1 and can, as I wrote in November, go "From City Bike to Lowrider in Nothing Flat" (Includes a Video. ), is set to debut in the Spring of 2009. 1. Under the title: "In Celebration of the 5th Anniversary of The Cycling Dude." 2. On page 3 is a quote from my post on the SwitchBike. 3. On Page 5 is an "About Cycling Dude" paragraph with the URL of this blog. The Lowdown on Glider Riding and The SwitchBike - PDF.